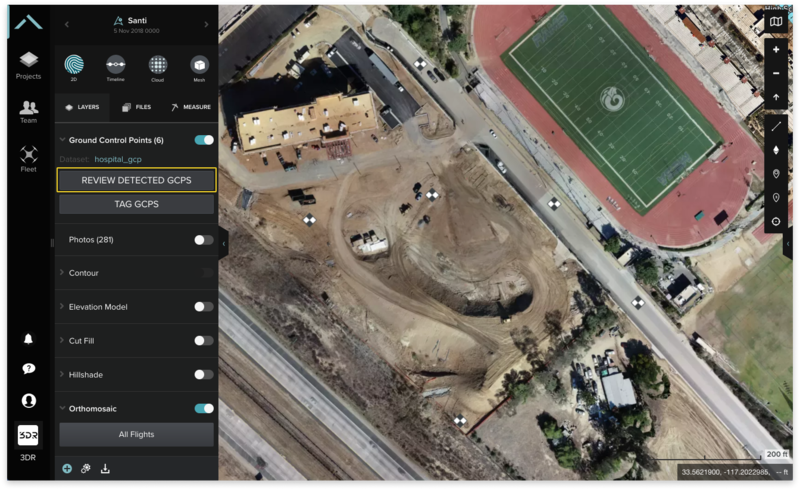 Site Scan now uses computer vision to detect certain types of ground control points in aerial photos. The model is trained to detect orange or white spray painted X's and white and black checkerboard patterns. 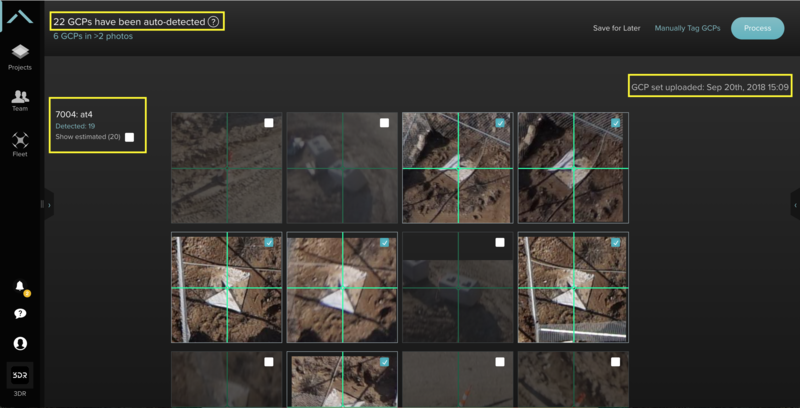 Overall detection becomes more accurate as more photos are processed with our model. When GCPs have been autodetected in a flight, and there is already a GCP set uploaded to that project, there will be an additional button in the Ground Control Point layer dropdown called "Review Detected GCPs". After you select to review, you will see all of the flight's image thumbnails with GCP's auto detected or estimated. You will see the total amount of GCPs detected, the name of each GCP set and the amount of photos that have detected or estimated GCPs, the date of upload for the project's GCP set, and the amount of GCPs that have or haven't been detected in multiple pictures. There are two types of detection in Site Scan's computer vision GCP workflow: detected and estimated. An image with a detected GCP is automatically selected for processing. An image with an estimated GCP is automatically deselected and won't be used in processing, but you can select and adjust the image if a GCP exists. "Estimated" means a GCP wasn't detected but could exist in the image. If you need to adjust any images, simply move the image in the thumbnail to align the center of the GCP to the green or white crosshair. For a closer look, select the top left expand icon for the image to expand. To finish, select Process to process your flight with these tagged GCPs or Save for later to review GCPs at a different time. You can also select the standard manual GCP tagging flow at any point by clicking on the button next to Process.